LinkedIn has become the de facto platform for all business professionals on the planet, but not many appreciate its roots, the journey it has taken and where it came from – so here’s a blog to explain the history of LinkedIn. LinkedIn started out in the living room of co-founder Reid Hoffman and the site officially launched on May 5, 2003. Reid has previously been on the board of Google, Ebay and PayPal, so had a proven track record before taking the first round of funding and eventually floating on the New York stock exchange. This also goes some way to explaining the great integration between Google and LinkedIn. 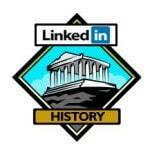 LinkedIn went live on the 5th May 2003, yes that’s right it is over 11 years old this year. LinkedIn is one of the oldest mainstream social platforms, older then YouTube, Facebook and Twitter. The mission statement was keyed to connecting the world’s professionals to make them more productive and successful. At the end of the first month of full operation, LinkedIn had a total of 4,500 members in the network but on a bad day it would only get 20 sign ups – put’s it all into perspective doesn’t it! LinkedIn’s founders were Reid Hoffman, Allen Blue, Konstantin Guericke, Eric Ly and Jean-Luc Vaillant. The management team is made up of seasoned executives from companies like Electronic Arts, Google, Microsoft, PayPal, TiVo, and Yahoo. Express to promote their offerings to its clients. This really started to broaden out its appeal and took membership up to 1,217,647 at the start of the year. In this year LinkedIn started to get into business mode with the launch of its jobs and subscriptions paid options and moved into an even bigger office (it’s fourth in three years). Membership had scaled to 4,192,941 at the start of this year. At the start of this year LinkedIn had over 5 million members (5,098,823) and launched public profiles as a record of your current and past career. It was also the first year that LinkedIn recorded a profit. To unlock the social proof aspects LinkedIn also launched recommendations and to make it easier to connect it released “People you may know” functionality, both of which are still in use to this day. In 2007 things started to get serious, Reid Hoffman decided to focus on running the product and Dan Nye stepped up to lead the company. There were 17,131,764 members at the start of 2007. LinkedIn start to extend away from its US base with its first international office in the United Kingdom and opened up both French and Spanish versions of the platform to its 33,077,647 members at the start of 2008. As the user count tipped over 55 million at the start of 2009 there was a change at the top with the arrival of Jeff Weiner who first joined as President and then became CEO. His priority was to clarify LinkedIn’s mission and values to set some strategic priorities. As the business entered this year it was starting to grow amazingly fast with 85,411,764 members at the start of the year. It opened up more offices around the world to take it to ten international sites and over 1,000 employees in the team. This is the year things got very serious with a listing on the New York Stock Exchange (at $45 per share) and even hosted a town hall meeting with Barrack Obama, the current US president! At the break of the year LinkedIn had over 135 million users. The year the interface all changed, Weiner was focused on making LinkedIn simpler, enabling growth and making it more every day for everyone and to this end released new profile layouts and functionality throughout the year. Over 50 million additional members joined last year taking membership to 186,930,823 at the start of 2012. As LinkedIn turned ten it celebrated its birthday in style, not just with a lot of press and a big party but with over 225 million users across the globe now. LinkedIn lowered its age of entry and targeted graduates and early stagers. LinkedIn has grown substantially with more than 5,400 full-time employees with offices in 27 cities around the world to reflect its footprint in more than 200 countries. Fastest growing area is graduates and students as they start to realise and leverage the platform. LinkedIn has topped 315 million users globally which statistically is the majority of professionals. The research is not conclusive but I have seen estimates between 350 to 600 million business professionals on the planet, so over 50% of the business professionals on the planet are on LinkedIn! The platform has grown steadily since day one with the current rate at two new user accounts being created per second and that’s more than one million new users each week joining. LinkedIn continues to grow, they add (and remove) features to keep the experience delivering for the users (paid and free) and it has become the default look up for all serious business professionals. They continue to be acquisitive purchasing CardMuch, Connected, Rapportive, Pulse, SlideShare and more recently newsle and bizo. Where does it go from here other than bigger and bigger? Who knows! But it will be interesting to see. Where do you go from here? Where do you want your LinkedIn to get you? If you need some help just shout! I’m looking for a comprehensive manual or book on everything LinkedIn and how to best make use of it – do you have a recommendation? In the last week, alone, I went from 73 connections to well over 600, and I’m on the verge, within literally a couple more weeks of completely penetrating my target market as an executive recruiter/headhunter, but I don’t want to make any mistakes as I begin the process of engaging my newfound network using both LinkedIn and personalized, targeted email merges using an Outlook add-in. I want to be careful, beginning with the end in mind so I need a one stop point of reference for all my LinkedIn needs. It’s so exciting. I’ve been “headhunting” for 28 years now, and I just built a network in a week that would have taken me over 5 years or more to build from scratch in the old days! I have been chased to write a book for years and always took the view that it was kind of pointless as it all changes so fast! Both the application itself when LinkedIn make changes (most days at present!) and also how people look at and use the platform and hence I could never justify the time to do it. The best way to make it work is to either get yourself on a course from someone or keep up to date by watching the blog here. The one observation I would make is to think about your strategy for building your network as vision of interesting people and access can be diametrically opposed if you’re not careful.